After the difficult choice of a flooring, you stopped on a laminate. Now you are tormented by a question how to take care of it. First of all we will pay attentionon the structure of a laminate. Upper protective layer is the most important. If we damage it in use, then the laminate will lose the gloss and will become subject to scratches and moisture. It is also necessary to put a rug which will detain hit of sand to your apartment in a hall. 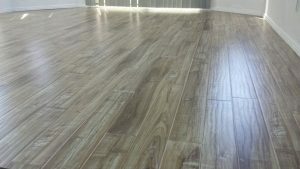 Sand can scratch a laminate of any durability. 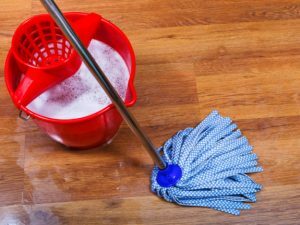 Is it possible to wash a laminate? There are types of very moisture resistant laminate which can be installen in kitchen and even in a bathroom area. but most of laminate types doesn’t “love” moisture at all. Even if the upper protective layer isn’t damaged, water can get into laminate connection and a laminate will inflate. For the same reason it is undesirable to apply water-based glue if you want to put the laminate on a wall. So how to wash laminate? For a start we will exclude the washing vacuum cleaner behind because it leaves a lot of moisture. It is possible to wipe with only a little damp rag. vacuum with the dry vacuum cleaner, using a brush with long fibers not to scratch a laminate. the robot vacuum cleaner, it sweeps the floor using small brushes. Cleans quite well, will come into all hard-to-reach spots and saves to you time. Try not to allow accumulation of dust and the most important of sand on a laminate. The choice of detergent depends on extent of pollution of a laminate. Attentively study the label of detergent it supposed to be compatible with laminate flooring. Using warm water (1 gallon) you can add one tablespoon of vinegar. It cleans quite well. If dirt or other spots didn’t give in, then use more professional household chemicals. 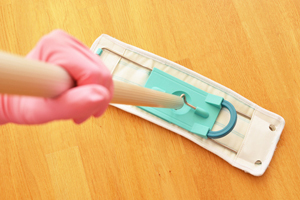 After cleaning, wipe a laminate with slightly damp rag. Microfiber will be modern high-quality material for laminate cleaning. How to clean spots on a laminate? You had difficult spots on a laminate, for example: felt-tip pen, fat, paint. fat is well washed by dish detergent. carefully clean a wooden or plastic scraper not to damage a laminate surface. If there are scratches on the laminate flooring, then use the special covering pencils. They fill a cavity of scratches and quite well keep inside.